With trying to eat more natural foods, comes groing your own. I know, it's not very "Hunter-gatherer", but it beats gathering your pesticide-laden greens at the supermarket. Besides, I got tired of paying way too much money for a few lettuce leaves, if I could get a packet of organic seeds for the same price and grow hundreds more. I started with a tiny square foot garden box and some easy to grow greens: lettuce like romain, rocket and Lollo rosso. Also some swiss chard (wich is awesome, since it grows right back after harvest so you can harvest the same crop at least three times). Another very easy vegetable to grow yourself, are beets. I also tried to plant carrots and cauliflower, but the cauliflower never really grew more than an inch, so I took it out and planted some more lettuce. I got to harvest three crappy carrots, so that failed too. 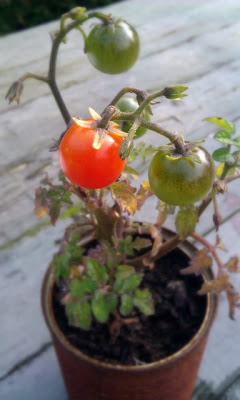 And the picture above, is all that's left of my attempt to grow cherry tomatoes. Sad, isn't it? I planted about five different plants, and this is the only plant that has actually grown, instead of died after three weeks. It yields no less then a whopping four tomatoes...now I honestly hope that they at least all become red and eadible :-) If anyone has any tips for me on growing tomatoes, please, I'm open to all suggestions.